The SPLixel Basic accepts TTL serial input at 57600 baud, and handles all of the timing required to run the LEDs. 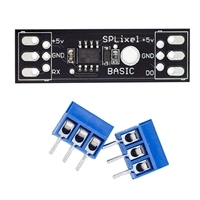 With the SPLixel Basic, you can address any individual LED, or use some of the many built in functions that address all of the LEDs. Fun animations included. Once the SPLixel Basic receives its command, your main processor is completely free to do ANYTHING else you want. The SPLixel Basic does all of the work running the LEDs. If you have chosen a continuous style function the SPLixel Basic will continue to run without any additional commands, until it is told to stop.